The chances of anything coming from Mars have taken a downward turn with the finding that the surface of the red planet contains a “toxic cocktail” of chemicals that can wipe out living organisms. Experiments with compounds found in the Martian soil show that they are turned into potent bactericides by the ultraviolet light that bathes the planet, effectively sterilising the upper layers of the dusty landscape. Wadsworth’s research was driven by the discovery of powerful oxidants known as perchlorates in the Martian soil some years back. Hints of perchlorates first showed up in tests performed by Nasa’s Viking lander missions 40 years ago, but were confirmed recently by the space agency’s Phoenix lander and Mars rover, Curiosity. In 2015, the Mars Reconnaissance Orbiter spotted signs of perchlorates in what appeared to be wet and briny streaks that seeped down Martian gullies and crater walls. Further tests found that the UV rays broke down the perchlorate into other chemicals, namely hypochlorite and chlorite, and it is these that appear to be so destructive to the bacteria. It's a bit strange that we can't find the source for that image. The discoloration seen on the image in the paper may be a false color representation which is sometimes used to better distinguish details, as explained here. Although I don't know whether the camera's science filters are applicable for that particular image. 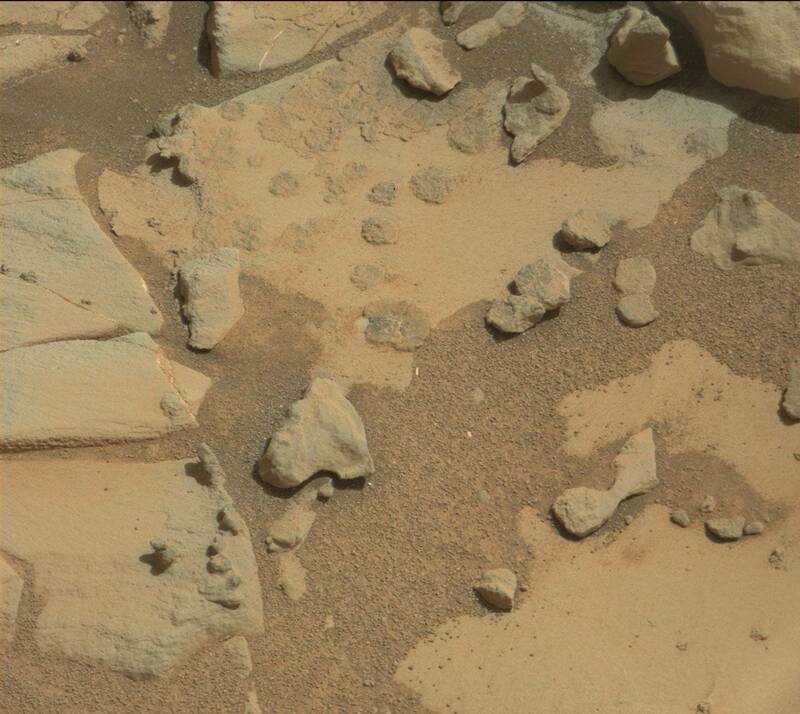 And here we can find the sol 890 images in the MSL analyst's notebook. 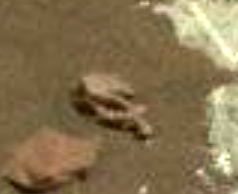 So, how can I trust the work of people that publish a scientific paper and get the identification of two photos wrong, pointing to sol 820 when it was from sol 890? I agree that more care should have been taken since the correct identification of photos and how they have been processed is key when theorizing about life on Mars. One would hope that someone is going to proofread and check the paper prior to publication. And while looking into the details, perhaps they'll also point out that one of the scientists they quoted, whom they cordially refer to as "Ruffi" is actually Steven W. Ruff. Yet, I think some of the points they make are really interesting and the different sources they included are quite impressive. I also think it's generally important that other experts, apart from mission scientists, take part in the discussion about life on Mars. Because everyone makes mistakes. There is still a lot of good information in the paper. I think a lot of what is in the paper could turn out to be fact. I believe the blueberries have a good chance to be related to life on Mars in some way. Because of the blueberries Oppy has given us the best images of what may be life on Mars, but all the rovers have given us some images. There is also this report from years ago. These MSL images were taken in a dry lake bed at Yellowknife Bay. Nora Noffke, a geobiologist at Old Dominion University in Virginia, has spent the past 20 years studying these microbial structures. Last year, she reported the discovery of MISS that are 3.48 billion years old in the Western Australia’s Dresser Formation, making them potentially the oldest signs of life on Earth. In a paper published online last month in the journal Astrobiology (the print version comes out this week), Noffke details the striking morphological similarities between Martian sedimentary structures in the Gillespie Lake outcrop (which is at most 3.7 billion years old) and microbial structures on Earth. Sure everyone makes mistakes, but publishing what is supposedly such an important work without confirming the information they publish makes me doubt their professionalism and thoroughness. Also, it doesn't help the publishing and peer reviewing process, as either the peer review didn't worry about that detail or it wasn't present on the reviewed paper but added when published. But this is just me. There is still a lot of good information in the paper. I think a lot of what is in the paper could turn out to be fact. Yes, there's a lot of information in the paper. The most important thing is that these are funky fungi. Maybe it's some of that funky fungi, too.